I just found out that Colin Neale died last month at the age of 89. 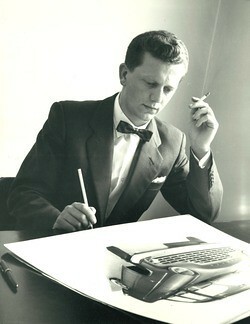 Neale worked for Briggs as a stylist in the early 1950s. When Ford of Britain bought Briggs in 1953, Neale was made the head of Ford of Britain's then new design department. Neale get the credit for designing the Mk II CZZ cars and over saw all British Ford design through the Consul Capri. Neale moved to Dearborn in 1958 and worked on the Thunderbird, Lincoln Continental, and the compact Fairlane before moving on again to Chrysler in 1962. Neale settled in the Detroit area and had a restored Consul Capri which he would take to car shows. I had the pleasure of meeting Colin Neale through his Capri, of which he was inordinately proud. Still full of boyish enthusiasm for planes, cars and all things design, it turned out we had common interests beyond Fords and so the time passed very quickly; I was looking forward to further chats with such an interesting man, but unfortunately it was not to be. Thanks for the memory and the photo. Were you at his service? My father recently bought Colin Neale's Capri Radio. Yep, it was Mr. Neale's radio.